A real flower and fake flowers look alike, but they are not exactly the same. Some fake flowers tend to look so real that people believe it to be real at first glimpse.People are also real and fake like flowers. 1. A real flowers blooms and also dries. (The real people become happy and also sad). 2. 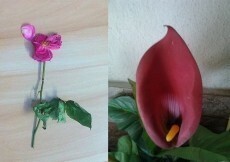 A real flower is affected by its surrounding /environment but fake flowers are not affected. (The real people are affected by their surrounding/ environment but the fake people are not affected. There is no effect on the fake people; their heart does not melt when they see someone unhappy or in pain). 3. A real flower spreads its fragrance for free but fake does not have any natural fragrance at all, it just looks beautiful from outside. (Real people share love freely. Fake people just pretend to love others). 4. A real flower spreads its fragrance without any discrimination. (The real people also behave without any discrimination). 5. Butterflies are attracted towards the real flower and find nectar. (People are attracted towards real people and learn something good). 6. A real flower contains nectar. (There are good qualities in the real people). Real flowers never stop anybody from taking nectar. 7. If water is given to real plant then many flower blooms. But the fake flower plant remains same, no flower grows on it. (When we love real people then they also give more love in return. But in case of fake people, they do not give any love in return. Just like water is wasted by giving water to the fake plants, in the same way love is wasted by loving fake people). 8. A real flower is spreads its fragrance without asking, but fake flower does not give any fragrance even on asking because it does not any fragrance at all. (The real people give love without asking but love cannot be found even after asking from a fake person, because they do not have love and the main reason is that they are full of ego. They only want their egos to be fulfilled by other people. Fake people only want attention of others; they do not give attention to other people). I loved this article.I Think we are all both real and fake people depending on who we are with.It is a two way thing and in my experience two or more people almost instantaneously react to each other on more of a subconscious level than "thinking things through" which takes time. I don't agree with you.I have seen many people who are always kind and loving; even if they are angry on you it is for your betterment. Here ‘FAKE’ means those people who never change their attitude no matter how much you love and care. Neither they will reject you nor they will accept you. They will keep you in middle and torture you by showing fake love. They just want your attention. They are very egoistic people. The more you talk and give attention to them the more their ego is nurtured. And the main thing to notice is that it doesn’t matter if you are talking good or bad, it doesn’t matter if you are praising or insulting them ; They just want you to keep talking about them. You will think that you have done a great job by abusing or insulting them; but the main thing to notice here is that while abusing and insulting you have given you attention to them and this is what they want. Now they will again do something more odd so that you give your more attention to them. Beware of these kind of people. These are the people who spread hate in society. They will keep ignoring, and torturing your from inside but in return they want love from you all the time. These kind of people are fake people. Assigning Blame; What`s The Point? This page was created in 0.3709 seconds.